In “Securing our Common Future: An Agenda for Disarmament” , the Secretary-General recognizes the importance of nuclear-weapon-free zones as efforts to assist the international community in preparing for a world free of nuclear weapons. In order to implement the Agenda, Secretary-General and the High Representative for Disarmament Affairs will work with Member States to strengthen and consolidate nuclear-weapon-free zones, including by facilitating enhanced cooperation and consultation between existing zones, encouraging nuclear-weapon States to adhere to the relevant protocols to the treaties establishing such zones, and supporting the further establishment of such zones, including in the Middle East. Nuclear-weapon-free zones should be established on the basis of arrangements freely arrived at among the States of the region concerned. The initiative to establish a nuclear-weapon-free zone should emanate exclusively from States within the region concerned and be pursued by all States of that region. The nuclear-weapon States should be consulted during the negotiations of each treaty and its relevant protocol(s) establishing a nuclear-weapon-free zone in order to facilitate their signature to and ratification of the relevant protocol(s) to the treaty, through which they undertake legally binding commitments to the status of the zone and not to use or threaten to use nuclear weapons against States parties to the treaty. 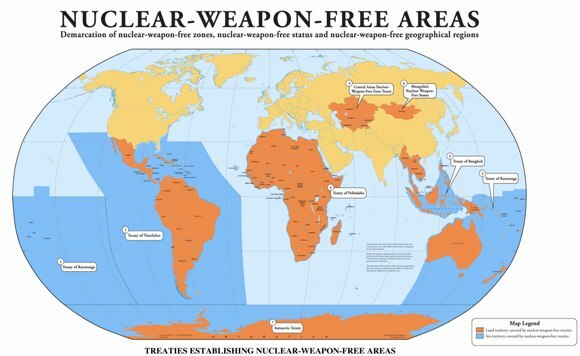 A nuclear-weapon-free zone should not prevent the use of nuclear science and technology for peaceful purposes and could also promote, if provided for in the treaties establishing such zones, bilateral, regional and international cooperation for the peaceful use of nuclear energy in the zone, in support of socio-economic, scientific and technological development of the States parties. The text and status of all the above-mentioned treaties are available on the UNODA Treaty Database.